The masterful planning offered by Bellago Homes for “Vistas Montanosas” has brilliantly matched elegant living with the Old World Charm of Tuscany. The three distinctive 2, 3 and 4 bedroom floor plans feature designer cabinetry, oversized windows, wrap around kitchens, spacious master bedroom/bath suites, skip trowel texturing and rich interior appointments. Experience the charm of this luxury gated community as you treat yourself to the clubhouse, which features a putting green, pool, spa and guest lounge area. 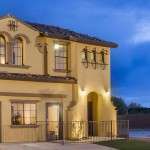 The design of the homes and improvements in this community provide a seamless marriage. As you enter through the rows of date palm trees to the iron entrance gates, the first thing you will notice is the dark iron doors of the Tuscan style clubhouse, which is the focal point of your new community. 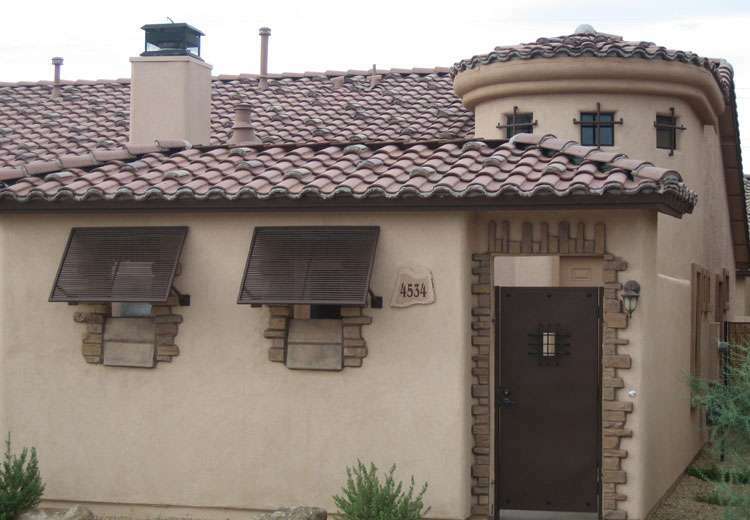 The rich Tuscan designed architecture of each home with heavy random mudded tile roofs and custom designed elevations is truly a work of art. 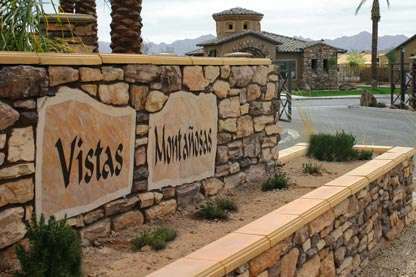 We believe that this new and exciting community will be considered one of the most beautiful in Arizona at this price range. We invite you to come and see for yourself! The Stanza- 1,013 SQ. FT. This 2 bedroom model has a big heart. The bedrooms are at opposite ends of the home, perfect for your privacy. The great room is generous and open to a large kitchen with easy entrance both from the garage and great room. The master bedroom is large with a spacious walk-in closet and mirrored doors. You will enjoy the arches that separate the kitchen from the living area. The Cantera- 1,415 SQ. FT. If you love to cook this is the perfect layout for you with a large pantry close by. The large Master suite is split from the other rooms at opposite ends of the home. You may personalize the home with the option of making the 3rd bedroom a den. The family room and master bedroom are large and spacious. The Villa -1,348 to 1,676 SQ. FT. This is our newest plan which features a raised turret entrance. 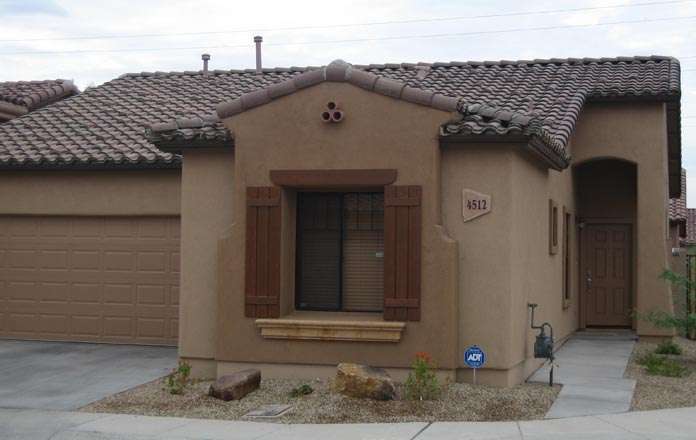 The Villa comes standard with a front courtyard area and two covered patios. Our floor plan offers an optional 4th bedroom, bonus room or casita addition to be flexible enough for your family needs. 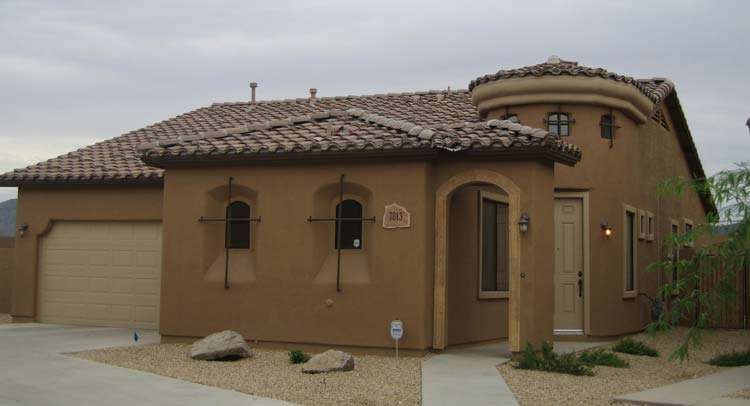 You will find that the Villa floor plan will set a new standard for courtyard living.